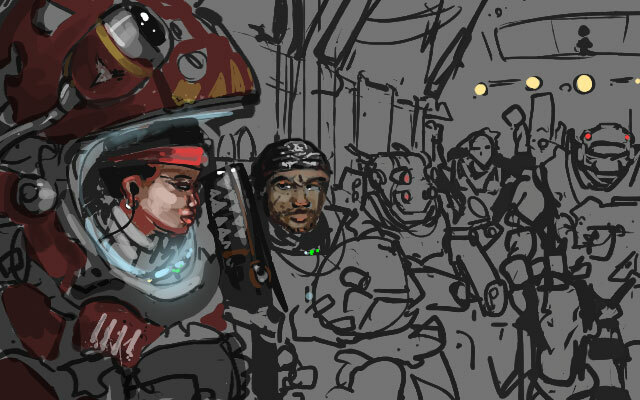 It’s been a bit quiet so I figured I could show some of the in-progress illustration work I’m doing for Starsector to flesh out the world of the game and events therein. So let’s have a look through my illustrations folder, shall we? Do note that most of these are very much in-progress, though of course I’m not going to show you any of the truly failed compositions. Still, I do hope you find it interesting to get a glimpse into my process here. Now these illustrations are intended to be shown in-game as an accompaniment or decoration rather than used as promo art so they’re much smaller than earlier work I’ve shown on the blog here. This has the added advantage of making the process of creating them much faster than full-sized drawings. It’s more interesting for me, too, because I can experiment more with theme, composition, and technique. 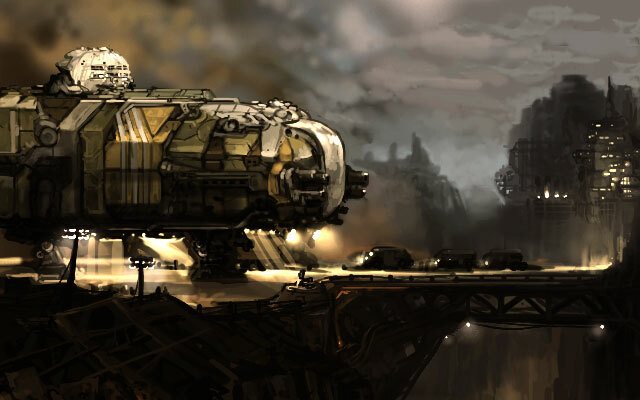 Starsector is created by a very small development team so it can’t very well have separate game modes for walking around every space station and backwater colony the player comes across. Many different locations need to be distinguished as cheaply as possible, basically. 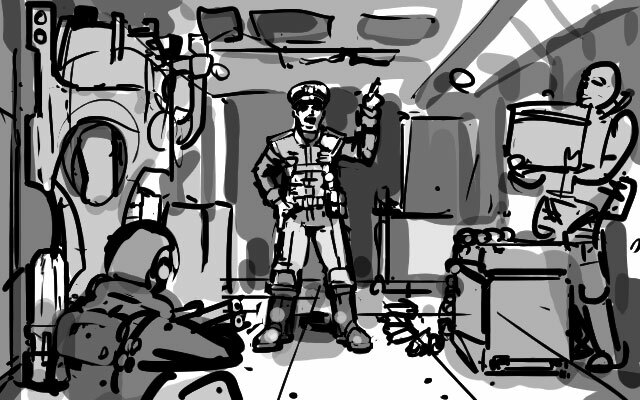 So: we offload description to text and a sort of “Starsector Holiday Snapshot” illustration — and that’s where I come in. Arcology interior: Yes, I played way too much Sim City 2000. This one certainly owes to Paulo Soleri by way of, yes, Sim City 2000. Arcologies are intrinsically cool and I swear I’ve been drawing them for upwards of 20 years now. Enough said. I must admit that the shape of those towers comes from some building in the intro video to Quake 2. I never got over it for some reason. 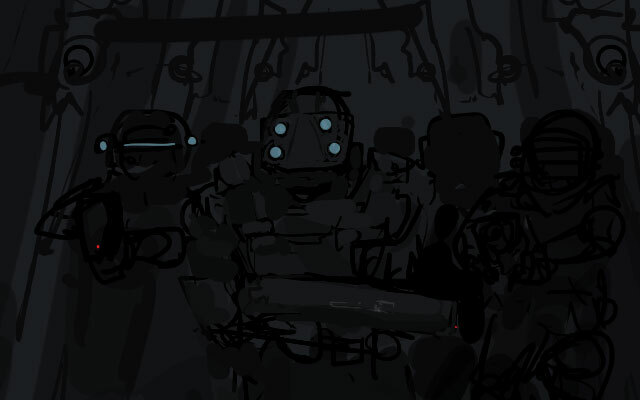 Also once I got this far into the sketch I realized that I really shouldn’t put too much information about what is in the sky of the planet because that means Alex couldn’t use this for an outpost in orbit around, say, a blue gas giant. Oops. This is probably a good time to dissect the exact dimensions of the Hound landed in this image. So there: change up the perspective so you can’t see the sky. Again with the huge inter-tangled cities, yes. 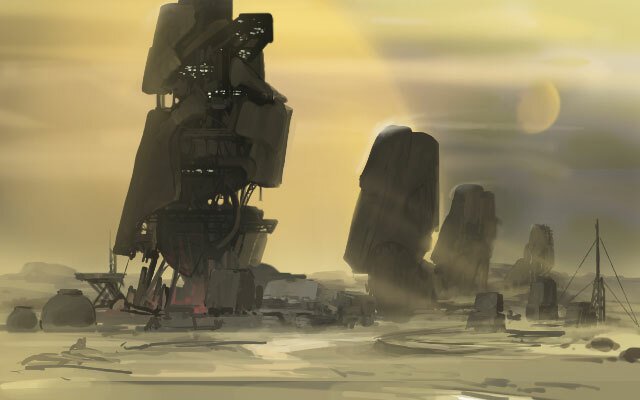 Not every planet has proper facilities — these ones seem to have been bombarded into a pile of scrap some time ago. But people make do. Piles of rubble and ruined cities are also good. 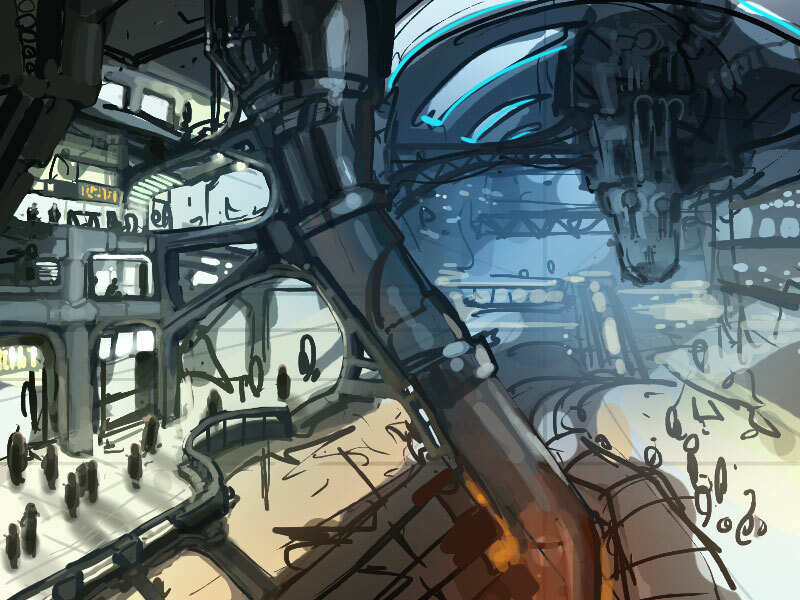 I really must make a note to start some images of barren worlds and space-stations. One set is a pack of inhuman killing machines, the other is a sort of roguish band of mercenaries with faces and individuality. 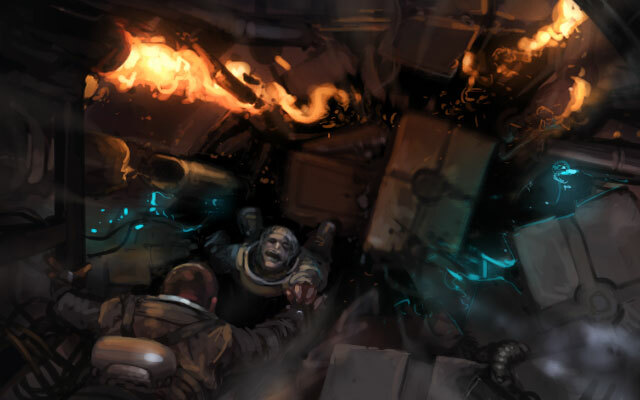 Are you so quick to burn through marines to take enemy ships if you’re reminded that they’re meant to be people? A touch like this can nudge the meaning of the game away from what the raw mechanics tell you. Hull Breach: It’s not a good day for the Deck 3 maintenance crew. 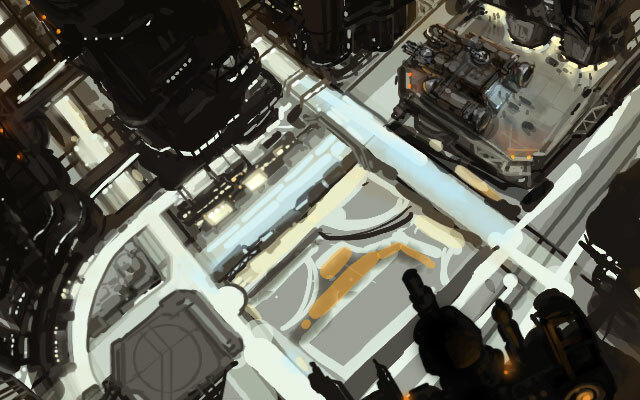 I’m very much looking forward to exploring how the setting and narrative impact of Starsector can be expanded through illustrations as Alex creates new mechanics and starts rolling in the higher-level campaign. I’ll leave you with that; It’s going to be fun. This entry was posted on Tuesday, May 7th, 2013 at 1:23 pm	and is filed under Art. You can follow any responses to this entry through the RSS 2.0 feed. Both comments and pings are currently closed.